Your Knitting Pantry, Phase I: Gauge Addendum | Knit Like You Mean It. Isn’t it just always the way – you think you’ve written down everything you should, and then you realize you’ve forgotten one of the most important things. 1. Everyone knits at a slightly different gauge. To pick two people at random: I knit much looser than super-famous, amazingly cool designer Jared Flood (rav lnk). How do I know this? Not ’cause Jared and I knit side by side and compare stitches; I’ve taken a class or two from him, but Jared Flood would not recognize me on the street (sad for me). But I know he knits more tightly that I do because on every one of his patterns he lists his knitting gauge using a particular yarn and a particular set of needles. Usually, when I knit with that yarn and those needles, I get a looser gauge than he does. So…I have to go down a needle size or two to match him before knitting any of his patterns. 2. “But wait!” You want to say to me. “What if you just knit in the needles and yarn Jared recommends? You’ll just have a bigger sweater, right?” Unfortunately…only sort of. The knit stitch is not square. It’s fatter than it is tall. What this means is that, when a knit stitch gets bigger (like if you use a larger needle than is called for, or knit more loosely), it gets fatter faster than it gets taller. And THAT, my friends, is why my first two sweaters look like crop tops for someone taller than I am. Some day, if you ask nicely, I’ll post some photos. 3. 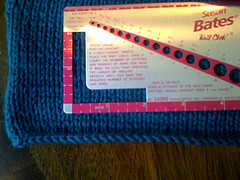 Since we can’t just size our way out of gauge problems (“Hey, it doesn’t fit me, but it will fit Mr. Trask!” is only an option if Mr. Trask keeps working on his crunches) we have to knit a gauge swatch to match our gauges. When Jared or any other designer finishes working on a design, he knits a gauge swatch with the needles and yarn he used, and that’s the gauge you must get in your yarn before you start working on your project. OK, that took more than 30 seconds. But friends don’t let friends skip gauge swatching. Any questions? I will happily answer them, for I am The Evangelist of Gauge Swatches. 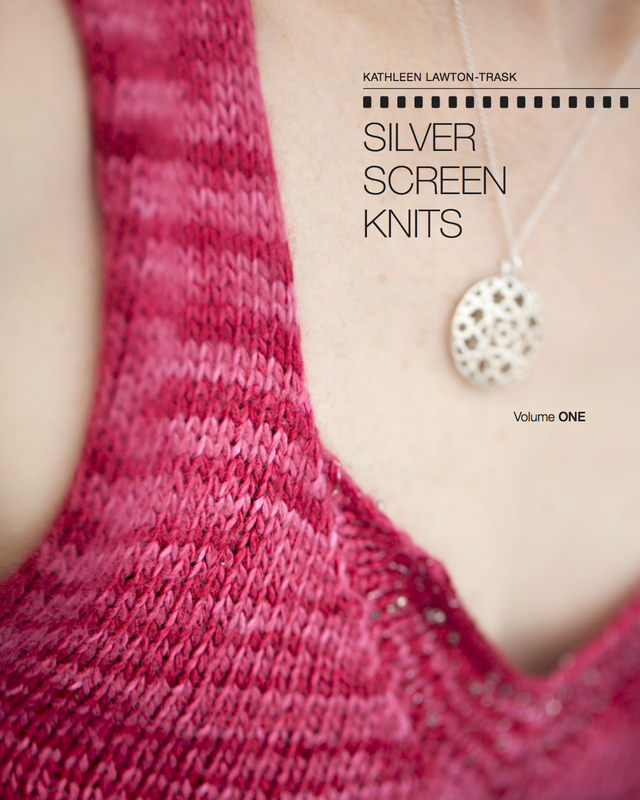 Knitting Help: Learn to Knit Videos (scroll down for gauge explanation), Knitting Glossary. This site has an enormous collection of videos showing all kinds of knitting techniques. If you can’t remember how to do the long tail cast-on, or if you’ve never learned how to knit two together through the back loop — this site is your new best friend (but I was your old best friend, right?). Ravelry (free registration! Plus, friend me – my username is KnitLikeYouMeanIt – send me a note and tell me who you are…). This is the miraculous online community that brings knitters together, collects information about patterns and yarns, tells you where you can buy the yarn that isn’t at your local yarn shop, and even helps you find that one ball of yarn in that particular dye lot that you must must MUST have to finish your project. Sign up and hop in! Okay, that’s it for Phase I. If you think anything else should be added – tell us in the comments! Since I highly doubt that I am EVER going to jump through all these hoops for a swatch, at least knitting a regular swatch won’t seem quite so onerous. I love your item #2. I’m a very visual person and can imagine those knit stitches stacked up and what happens to them. But when you say “It’s fatter than it is wide” do you mean than it is tall? I want to understand this fully. BTW, love to see the crop top photos ;-). That is great! Thanks for sharing it…and for the editorial help. I did indeed mean “fatter than tall” – and edited above. Sorry! As a former professional editor, I should see my own errors at least occasionally, shouldn’t I? Boo. Hey, I can find everyone’s mistakes EXCEPT MY OWN! I think the mind just fills in the correct words even though they sometimes don’t make it to the page. Soooo.. while I’m at it… in this sentence: “And THAT, my friends, is why my first two stitches look like crop tops for someone taller than I am.” It’s such a great sentence, but perhaps did you meant “sweaters” instead of “stitches”? And will I now be banned from replying to these great posts? Or better yet, perhaps you can high light some of MY mistakes? Love the fatter than tall example. I am a visual learner, and as soon as I read that, I was mentally picturing what could go wrong with gauge. That is definately a learn something new every day type of thing for me.